Dublin-based skeleton (bobsleigh) athlete, Brendan Doyle, chats to The42 about his future ambitions. A LITTLE OVER six years ago, Brendan Doyle’s life was changed in an instant. Working as a young Garda one day, he was called to investigate a report of domestic abuse in a house in Dublin. Doyle arrived to find an aggressive man and a frightened woman, and attempted to apprehend the former. Unfortunately, it was during the ensuing altercation that Doyle’s hand was slashed by the knife-wielding man in question, and permanently damaged in the process. As a result of the incident, his baby finger and thumb no longer function, while countless hours of skin grafts and corrective surgery followed. Furthermore, the psychological trauma caused by the attack ultimately forced Doyle to quit his job as a Garda permanently, as he regularly began to suffer from depression and panic attacks, and struggled to deal with the anxiety, which inescapable memories of the incident continually prompted. He was diagnosed with post-traumatic stress disorder, becoming an insomniac and having to get by on just two hours of broken sleep a night for a sustained period between 2009 and 2013. However, Doyle is now feeling substantially better. While he still struggles to a degree with sleep, rarely falling unconscious until 2am at the earliest, he no longer wakes up in the middle of the night at regular intervals. And in relation to the insomnia, he adds: “It’s just the way my mind is, it doesn’t switch off. It’s still something I try to fix, but I’ve learned that I have limits and my body is approaching those limits. I’m aware of what’s going on, it’s not a sudden thing, so it gives me the ability to be able to handle it better. Much like if you see a car pull out in front of you, you can break and adjust for a new scenario. From this incredibly dark experience, there emerged a silver lining, however. Before he became a Garda, Doyle had been an athlete at a high level in some capacity since the age of 13, when he began to train intensively as a sprinter. “We’d all train up in Morton Stadium in Santry,” he recalls. “I’d see the girls who were doing bobsleigh training. It always caught my eye. “I was just training one day and they asked me if I’d give it a go. I jumped at the opportunity, so what happened was I got a skeleton sled. It’s kind of like in Cool Runnings, we have wheels on it. It’s just a normal athletics surface. 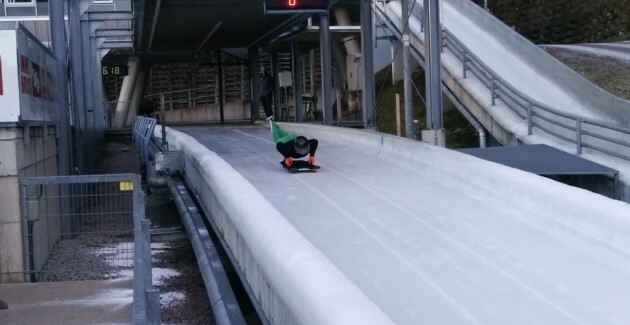 Having shown initial promise at a competitive level, an unfortunate twist of fate meant that Doyle was effectively forced to quit the sport before he could ever make any real impact on it, as the Irish Bobsleigh Skeleton Federation’s money was cut in conjunction with the collapse of the Celtic Tiger. As a consequence, Doyle reluctantly left life as an athlete behind, and proceeded to focus on his career with the Gardaí. And of course, fate intervened again, preventing him from pursuing this path in the long term ultimately. However, his departure from the Gardaí eventually enabled him to return to his previous life as a skeleton (bobsleigh) athlete. By now, thanks in part to the success of Sean Greenwood at the most recent Winter Olympics, the Irish Bobsleigh Association is in a far healthier position. Greenwood’s performance at Sochi 2014 means that Ireland are the highest ranked of the smaller nations in terms of seedings. And while Doyle may dream of emulating Greenwood at the 2018 Winter Olympics in Pyeongchang, there is a long way to go yet if he is to fulfill this ambition. That said, his return to action emphasised Doyle’s considerable potential. “The sport I’m doing is skeleton, so it’s like bobsleigh, except I go down head first [at speeds of up to 130 km/h]. It’s a toboggan basically, and there’s two main aspects to that sport — the acceleration phase and the drive phase. I’ve got a lot of power and a lot of acceleration speed, so that translates perfectly into skeleton. Nevertheless, the main issue is still finance. In order to compete at a high level, he estimates he’ll need over €20,000 in funding. But while the Winter Olympics is currently still a distant prospect, he remains undaunted by this uphill task, insisting: “I have never faced a challenge I couldn’t overcome.” For instance, he once tore his calf so badly in training that he was at risk of losing his foot at one point, and yet, it did little to quell his passion for the sport. “I’m training full time for this,” he explains. “Both my parents are sick, so I’m also looking after them. In terms of effort and energy, it is full time. I’m training six days a week, I take Sundays off… I’m trying to do everything I can — it’s an awful lot because my training sessions can be four hours, and then after that, I would do some recovery sessions. So I could be gone five or six hours a day, and then come back and try to hit up the emails and applications to here, there and everywhere. “I’m going to be putting any little money I do have into this. If I need to sell the car, I’ll sell the car. I’m going to put everything into getting to Pyeongchang in 2018. “We’ve got a lot of track knowledge and track coaches to get us there. All we have to do is build up competition in track time. We were in a position this year to get to the World Championships for team events — the only issue is that the other slider I would need to go with me has just got a new job in Bath and he can’t get time off. Nonetheless, to even get to this point, where Doyle is contemplating representing Ireland on the world stage, constitutes a remarkable achievement, given that he was seriously depressed and struggling to sleep as recently as two years ago. “If the accident never happened, I’d still be a Garda out in Crumlin,” he says. “I wouldn’t be possibly getting to the Olympics. I’ve been training hard since I was a 14-year-old, with goals of getting in the Olympic Games in my chosen sport, which was sprinting [initially]. Doyle emphasises that for anyone who might be suffering similar problems to those which he encountered in the aftermath of his accident, being prepared to discuss these troubles with a close friend or relative is vital. “Communication is key. I was in a job where you’re expected not to feel these things. We all know what happens, but when you put on that uniform, you’re expected to be almost like Captain America. Get in, get the job done. The lads would have drinks and that would be that. “The main thing I can say is that when you’re in the moment, things seem so much worse than they actually are. It wasn’t until I got that phone call from the skeleton association that I realised it wasn’t actually as I thought. I had suicidal tendencies. The lowpoint for me was when I was actually rationalising those thoughts. It wasn’t having those thoughts. “To deal with depression actually shows you’ve an awful lot of strength. If you’ve got a leg injury, you get a set of crutches, but there’s no set of crutches for depression. You just reach out, talk to people. There’s one or two lads, if something happened, I’d reach out straight away and talk to them. From: The Journal article on Sunday 9th August, 2015.